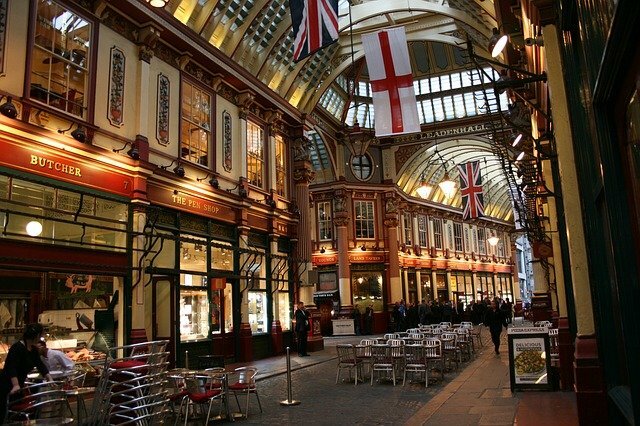 A guide to the City of London district, which is the oldest part of London that’s known as the financial and commercial hub of the city. 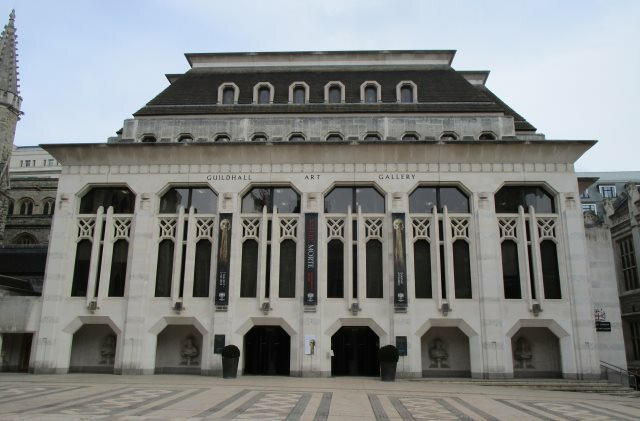 There are lots of beautiful buildings in the area (known locally as the square mile) as well as world-famous landmarks like the Tower of London and St Paul’s Cathedral. We’d recommend doing this self-guided walk during weekdays, when the area is most lively, and during the daytime. The area known today as The City of London was first established by the Romans, who named the area Londonium, and until the Middle Ages this small stretch of land made up all of London. 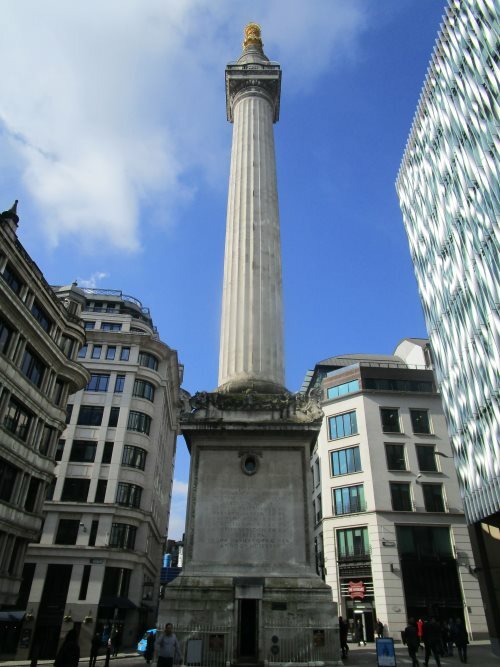 As the city expanded, this area become known as the City of London, and became the centre for London’s financial services. We’ll begin this City of London district guide at Tower Hill Underground Station, which runs on the circle and district lines. Exit Tower Hill Station, and you’ll see the Tower of London opposite you. 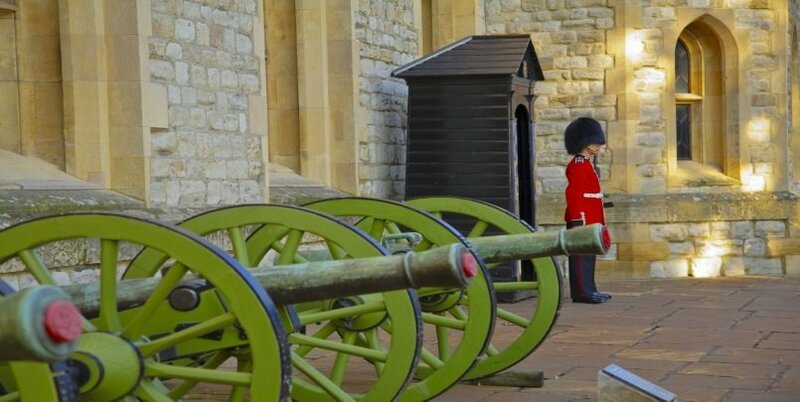 The Tower of London is the home of the Crown Jewels, and was at one time or another a fortress, a royal palace, a prison and a major tourist attraction! 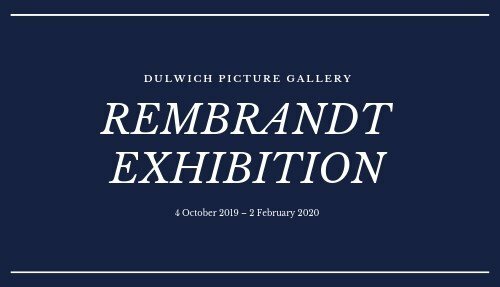 It is without a doubt one of the top things to do in London, especially if you are visiting with kids, and you could easily spend 3 hours here. 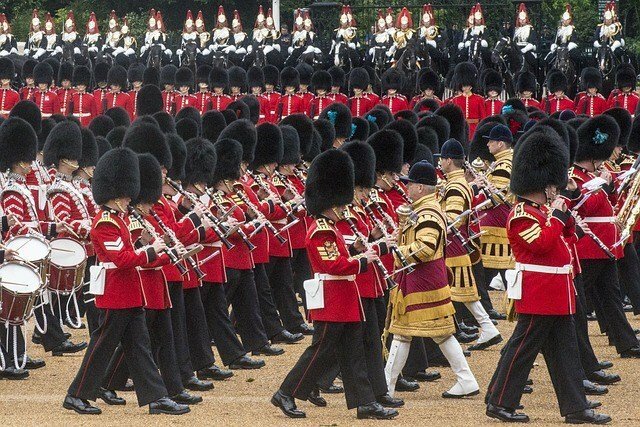 Highlights include the crown Jewels, amazing interiors, an exhibition on the British monarchy and the free entertaining tour given by the Yeoman Warders (the palace guards). Entrance queues tend to get really long during the summer months, so it’s worth considering buying tickets in advance. 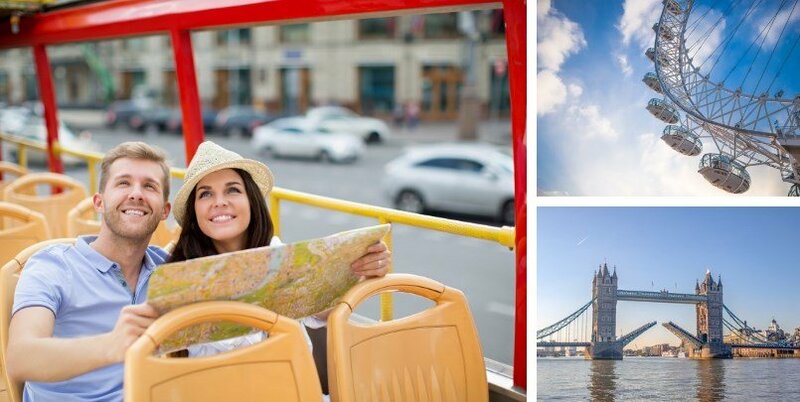 You might also consider visiting the Tower of London on a separate day, as the rest of this City of London District guide will take you most of the day. From the Tower of London, head towards the River Thames and take a right along Lower Thames Street, and soon after cross over the road onto Harp Lane, which leads into Cross Lane. You’ll see St Dunstan in the East Church garden at the end of the street. This has to be one of the most unique places you’ll find in the City of London, and it comes with a fascinating story. 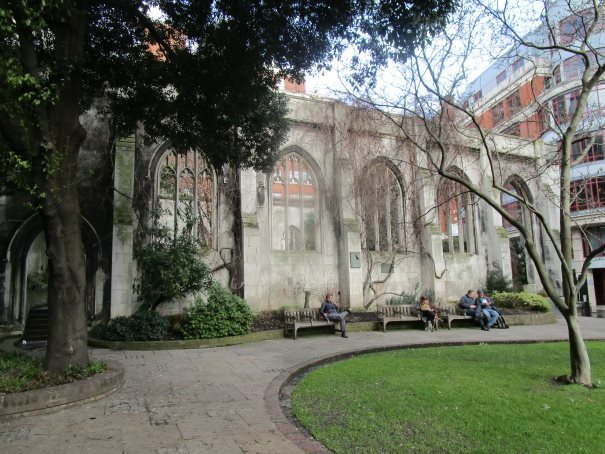 The Church of St Dunstan was bombed during the Blitz in WWII and was never rebuilt. Instead, the symbolic ruins of the church remain, along with a peaceful garden. On weekdays you’ll find lots of people on their lunchbreaks sitting on the bench taking a break from the hustle and bustle of city life. Cross to the other side of the church garden, walk along St Dunstan’s Lane, take a left to the end of St Mary at Hill, a right onto Lower Thames St, and right once again onto Monument St.
Take a right at the end of Monument Street and then a left on Cannon Street. There are lots of little interesting roads on your left hand side, and you might want to make a detour to visit a few of them like Suffolk Lane, Bush Lane, Dowgate and Cloak Lane. You’ll soon see Mansion House – home to the Lord Mayor of London. (You can’t go inside unless you prearrange to visit in a group of 15+ people). 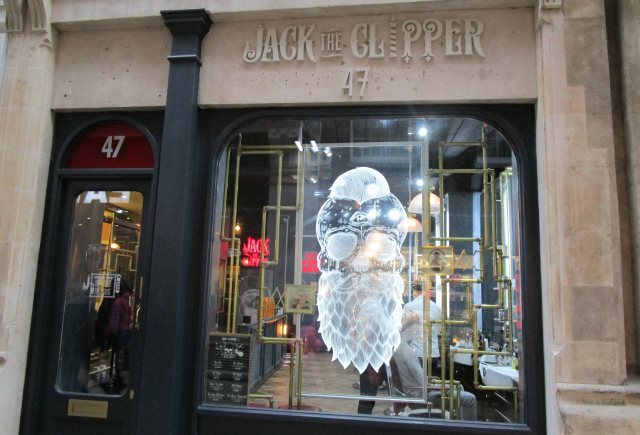 Bow Lane – Jack the Clipper Barber Shop! St Paul’s Cathedral is one of London’s most iconic symbols. 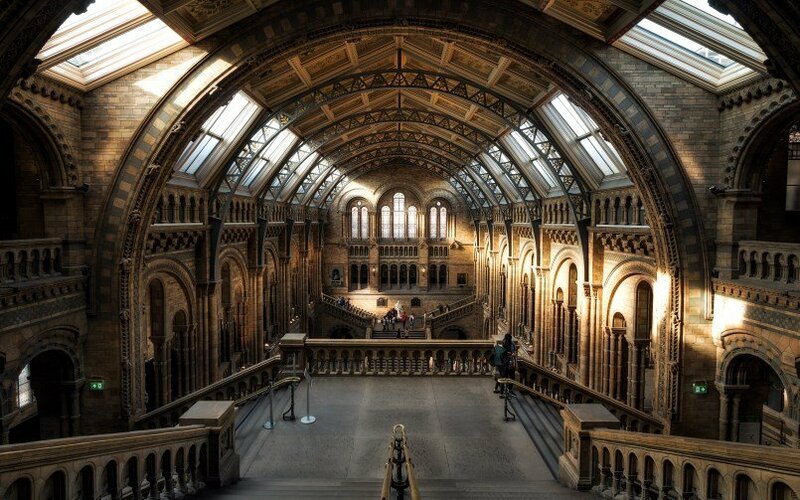 The interior is jaw-dropping in scale and in beauty, and highlights include the whispering gallery, crypt, and panoramic views of London from the Golden Gallery. It’s definately worth visiting…. Head back the way you came, along Watling Street, but this time take a left and head up Bow Lane. A right onto Cheapside followed by a left onto Kings Street and you’ll reach Guildhall, a dazzling square that is a symbol of the power and wealth of the City of London. On exiting Guildhall, look for a tiny allyway called Masons Avenue, which is one of a network of tiny narrow alleyways that characterize this part of the City of London. You might want to take a detour and just have a wander through the labyrinth of tiny walkways that are full of charm and character. Otherwise, just keep walking straight and eventually you’ll reach Telegraph Street (the name of the alleyway changes several times along the way). From here, take a right onto Tokenhouse Yard and a left onto Loftbury which leads into Bartholemew Street. Then a left onto Threadneedle Street and a right into Royal Exchange! 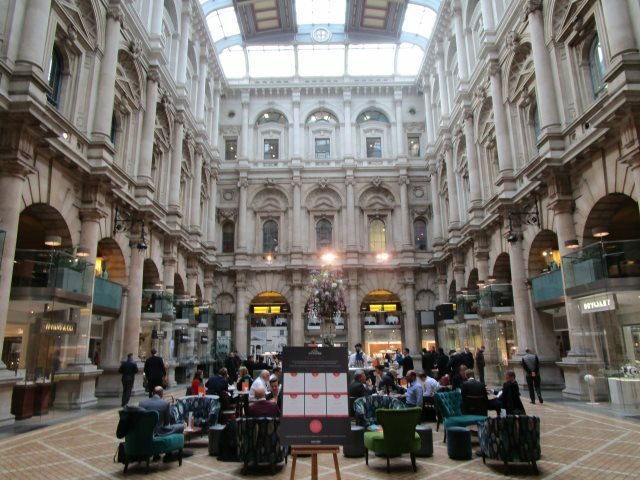 The Royal Exchange is a very grand shopping and dining centre. On the street outside are lots of expensive shops and cafes. Inside the Royal Exchange you’ll find an extremely grand interior (pictured above!!) This is a great place to have a coffee, or lunch in one of the bistro restaurants. You’ll also find lots of boutique beauty, fashion and watch shops. Leadenhall Market is a unique shopping and dining market right in the heart of the City of London. You might recognize it as being the set for Diagon Alley in Harry Potter and the Philosopher’s Stone. It’s a great place to have a bite to eat and end a day exploring the City of London. 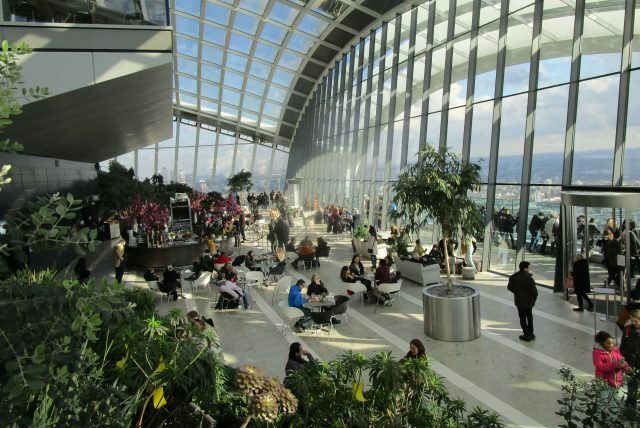 End the day with a visit to Sky Garden, London’s tallest garden with amazing views of the City. 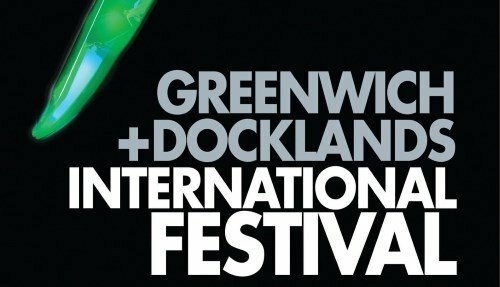 Entrance is free, although you have to reserve a ticket in advance from their website. There are several bars and restaurants located in the garden, which serve great food and cocktails. From Sky Garden, its a five-minute walk back along Cornhill street to get to Bank underground station (The station is enormous and runs on the Central, Northern, Waterloo & City, District and Circle lines). 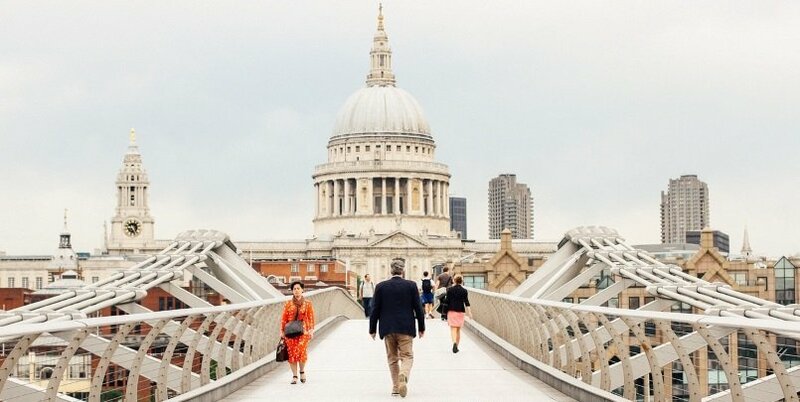 This City of London district guide will probably take you all day, but there are plenty of other London neighbourhoods to explore on the rest of your visit.